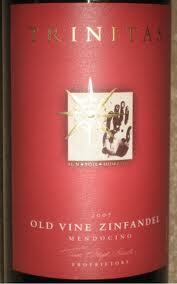 Wine Review: 2008 Trinitas Zinfandel Old Vine | Wine Splash! Very nice presentation with a deep garnet color and legs that go forever! Ripe strawberry nose with a hint of oak and chocolate. On the palate, lush dark berry, blackberry, and a hint of dark chocolate. Quite a mouthful with a good lively acidity. The finish was a bit short but very smooth and lush. We think this is a very good wine, more elegant than most Red Zinfandels, but lacks some of the zestiness we like. Overall, an 86 on our SiNoTas scale. Looking forward to the next vintage! Until then, we’re WineSplashing! Learn more about their wines at www.TrinitasCellars.com. Do you know where I can buy this? Thanks! We purchased this at a Busch’s store in Ann Arbor, Michigan. I am not sure where you are located but I know there are over 10 Busch’s stores in the Ann Arbor, Livonia, and Bloomfield Hills area. Good luck! It was a very good Zinfandel! Thank you so much, I found it absolutely fabulous and will follow up with Busch’s.